Season Four of House Husbands will premiere next Monday night. 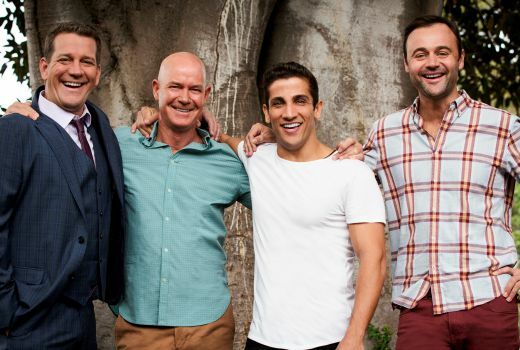 Lewis (Gary Sweet), Justin (Firass Dirani), Mark (Rhys Muldoon) and Kane (Gyton Grantley) all return along with Gemma (Julia Morris), Abi (Natalie Saleeba) and Alex (Darren McMullen) plus new cast members Justine Clarke, Arkos Armont, Jane Kennedy and the return of Jane Allsop. It’s not clear where Nine is programming Lip Sync Battle which has paired well with The Voice, but lost some ground without it. It’s also unknown whether The Hot Plate will serve as a lead-in to Nine’s drama, pending a court ruling tomorrow. The new series comprises 10 episodes, with the first a special ninety minute extended episode. mother new to Melbourne who ignites a tumultuous love triangle. Other new cast members include Akos Armont as the charming and ambitious Dr Saxon, Jane Kennedy who plays Belinda, the officious and cut throat director of the hospital and the return of Jane Allsop as Rachel, Mark’s (Rhys Muldoon) terrifying boss. encounter with Justin in season three. Too short notice and that will show in the ratings. That’s rather a suprise, I didn’t even know that they’d started running promos. I sincerely hope that the timeslot has been well thought out and can be maintained for the whole season. Glad it’s back! This is the only thing on 9 I watch, hope it doesn’t get mucked about! Given they are on a roll and not much in, I hope for better drama rating. 7 are damaging Winners and Losers but can’t see that either! Given how badly both Australian and international dramas have been rating this year it will be interesting to see how this goes.